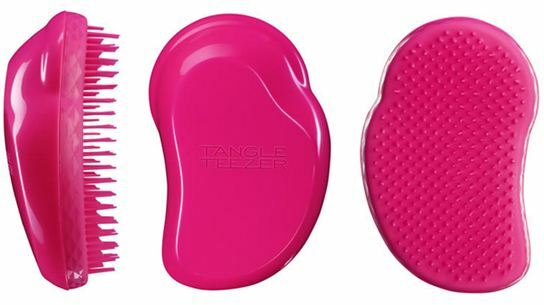 Have you ever heard of the Tangle Teezer? It’s been awhile since there has been a new type of brush, so we thought this new detangling hairbrush would be more of the same. How different can a brush be? However, after we tried it we saw that it actually is different from other hair brushes and combs. From what we can see, the biggest difference is that the bristles are narrower than what you would find on a paddle brush, and they are more flexible as well. So when you go to comb your hair this hairbrush works with your hair instead of against it. The downside is that you will have to do more passes on your hair to get really big tangles. Or you’ll have to comb your hair in smaller sections to ensure all the knots are being addressed. If you have hair that’s prone to tangles, this is definitely an easy fix. A bonus is that you won’t have to use a bunch of hair products to detangle your hair. We also recommend this for kids. This hairbrush is a product of Great Britain, but you can find it at beauty stores such as Ulta and Sally Beauty Supply. Tip: A great way to prevent tangles is to always keep your hair freshly trimmed. Split ends make your hair more prone to knots. I’ve seen a TON of reviews on this product, but I think I’d have to check it out in stores to see the bristles IRL. I would also have to look at this product. It does look handy enough to carry in your purse. Yes I have heard about this product and saw a video by Naptural85 and others on Youtube.I’m interested in trying it being I have very thick,curly/coily that is prone to split ends,breakage and tangles!I love my natural hair texture but I don’t love detangling sessions!Gonna try it out. i ‘ve been eyeing this brush- i’d like to see it in person.